Nasdaq-listed Unica has acquired privately-held Pivotal Veracity for approximately $17.8 million in cash, the company announced this morning prior to the opening of the market. The marketing software company picked up Pivotal Veracity, which was founded in August 2003, to ramp up its e-mail marketing software solutions in what it regards as a ‘logical extension’ of their offerings. Pivotal Veracity markets a suite of tools designed to optimize the deliverability, reputation and effectiveness of digital communication. Its software suite enables its customers, which include companies like Cisco, Classmates.com, Digitas, Nestle and Sears, to maximize e-mail content rendering and delivery effectiveness and reduce the cost of sending emails that never reach intended recipients, including those that are filtered by ISP and third party spam filter services, or end up in personal spam folders. Pivotal Veracity also helps customers protect their brands by minimizing the risk of being blacklisted, as well as ensuring that customers are actively protected by ISP and third party whitelists. 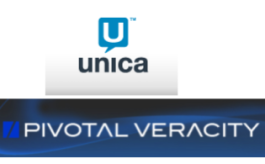 Unica had already integrated Pivotal Veracity’s solutions into its enterprise and on-demand offerings and says it expects to deepen that integration across both companies’ product lines and continue to sell Pivotal Veracity’s solutions on a stand-alone basis as well. Pivotal Veracity’s co-founders, Deirdre Baird and Michelle Eichner, will join Unica and guide the company’s efforts in e-mail marketing and deliverability. Unica says the acquisition is not expected to have a material impact to its revenue in fiscal year 2010 and should be neutral to slightly accretive to FY10 Non-GAAP EPS. The company’s stock is slightly down in after-hours trading.